And so begins the bye weeks. Welcome to nine weeks of less than 16 games and harder-to-calculate records & standings. Would you believe that the NFL seems to have no rhyme or reason for the number of teams that get a bye during week 4 of a given season? There have been years of two, four, six and even zero teams with a bye in week 4. OH MY GOD, THEY CAN’T GET ANY THING RIGHT. FIRE GOODELL!!! This week we have six teams on byes. The Ryan Tannehill thing was pretty strange, right? The Dolphins don’t have a young franchise QB to insert. Tannehill showed pretty significant improvement between years one and two. New system and offensive coordinator (I predicted in August that Andy Dalton would take time to adjust to his new coordinator, but it looks like I misfired). Only three games into the season. Who in their right mind would ride out his last season as coach with Matt Moore at the helm? Joe Philbin, apparently, is the answer. Is there something more going on here? Speaking of underwhelming quarterback play, it appears as though Chad Henne is officially our first QB benched for ineffectiveness. I’m not positive, but I think he might be the first three-time winner of this award! In our preseason picks, I went with EJ Manuel and guest blogger Neil went with Alex Smith. No points awarded. And with that, we have four quarterbacks making their 2014 debuts as starters this week. Two of them—Blake Bortles and Teddy Bridgewater—are rookies who have the hopes of some pretty downtrodden fan bases on their shoulders. The other two are also playing for franchises who fall into that depressing category, but these two men offer no hope. Mike Glennon hasn’t been around long enough to officially call him a dud, but he wasn’t able to stave off Josh McCown for a starting job this year. Charlie Whitehurst has been around long enough and we know he’s terrible. And yes, that’s who’s featured in the photo on this blog. 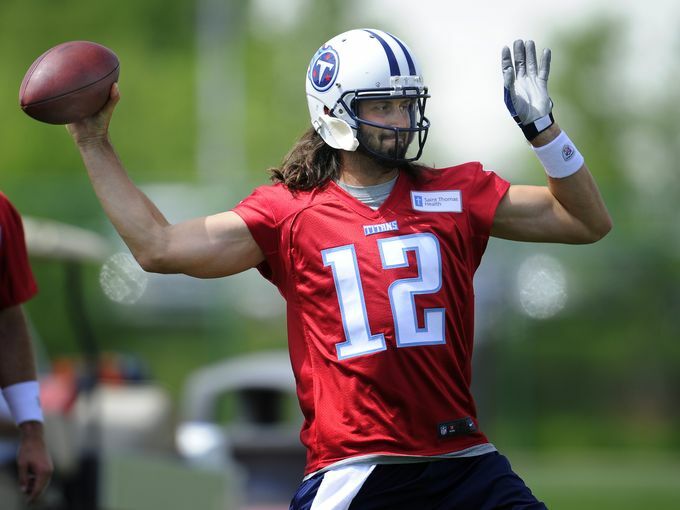 Clipboard Jesus gets to throw some passes for the first time since 2011 (And the Colts’ incredible luck just keeps chugging right along as Whitehurst leads the Titans into Indianapolis this weekend). Somebody talked me into signing up for FanDuel before the season started. I was extremely underwhelmed by it until I won $50 on a $5 buy-in this past week. So here’s my pitch. FanDuel is single-week fantasy football where you pick a team while making sure to stay under the salary cap (players are assigned dollar values on the site). You’re playing against possibly hundreds of others (all entrants can choose whatever players they want, meaning two people could be starting Aaron Rodgers) and you’re just trying to place “in the money.” Think of it like an online Poker layout, where you can buy into different leagues, each of which have different prize pools, buy-ins, etc. Anyway, I’m a fan now. If it turns out I didn’t just have beginner’s luck, I’ll start posting my roster before each week. Cincinnati: Dominant. On top of being the best-looking team in the AFC, the Bengals really only have four difficult games the rest of the year: @New England, @Indianapolis, @New Orleans, home vs Denver (I’m willing to include @Pittsburgh in week 17 as a tough game, but there’s a chance the Bengals are resting starters by then). Cleveland: Two last-play field goals by their week 1 and week 3 opponents are the difference between 3-0 and 1-2. And the Browns could realistically win its next five games: @Tennessee, vs Pitt, @Jacksonville, vs Oakland, vs Tampa Bay. Denver: They’re right on track with preseason expectations. They’ll want to win their next two (vs Arizona, @Jets) because then they play San Francisco, San Diego and New England (that Patriots game starts a six out of eight on the road stretch). St. Louis: These guys are fucked. Week 5 starts eight in a row against 10-win teams from last year. They are FUCKED. Arizona: This isn’t the same as the 2012 Cardinals that started 4-0 but anyone with half a brain knew they were total frauds. These guys aren’t going to suddenly lose nine in a row. But they probably still lose at least seven games. Seattle: Ship shape so far. That was a very difficult opening trio of games. After the bye they’ll get to work on some of the NFC’s lesser teams before the late season sequence of @San Francisco, @Philadelphia, vs San Francisco, @Arizona. I enter week 4 sporting a 22-24-2 record against the spread. I’m encouraged because I seem to be nailing my confidence picks and losing those 50/50 games. Those should even out. Let’s hope this is the week that the luck changes. Regardless of who’s playing quarterback for Washington, I feel like these teams are pretty closely matched. I don’t have enough faith in the Redskins to take them by more than a field goal. Interestingly enough in all three Thursday games so far this season, the home favorite has throttled the road underdog. So I guess if you’re into that sort of thing, the Redskins might be the way to go. Another item to make me nervous about my pick: What if Kirk Cousins is the type of guy who’s going to thrive in a big way now that he knows he’s the man in Washington for as long as he wants? What if he just plays out of his mind in his first home start where there’s finally no RG3/QB controversy stuff to talk about? OK, Aaron Rodgers, I’m willing to R-E-L-A-X for a little while longer, but what if you L-O-S-E at Chicago this week? And what if you beat Minnesota in two weeks but still can’t crack 17 points on offense? Then can we P-A-N-I-C? An important part of football gambling is being able to pivot on your preseason picks as circumstances change. Two teams that I predicted for the playoffs currently sit at 2-1. They both host teams with losing records in week 4. But due to a demolition of their respective defenses from injury, it might be time to turn on them. Those teams are Chicago and Pittsburgh. Neither team is particularly deep nor have they looked great when at full strength, and now they’re severely short-handed. Keep this in mind as you pick them in the coming weeks. Wow. I want to say we could see a record number of interceptions in this game, but that’s giving the two quarterbacks a little too much credit. Instead my prediction is that this game sets the record for most passes called uncatchable in a single NFL game. I don’t see this ending well for the Bills. It might be time to get those Kyle Orton whispers started again. Listen, this could easily be one of those picks I turn on as soon as I find out that 99% of the population is backing the Colts. But the Titans did just get throttled in Cincinnati and now they’re likely starting Charlie Whitehurst at quarterback. If I was picking teams in a pickup football game and the player pool consisted of a bunch of my friends and Charlie Whitehurst, I almost definitely would not pick Whitehurst with one of my first three picks. If you’re picking the Ravens simply because Carolina’s supposed to regress, don’t do that. Even if they win this week, there’s a very good chance the Panthers are losing their next seven. It’s a gruesome schedule that includes five straight games against 2013 playoff teams. Meanwhile, I wish there odds on the Ravens losing this game because of a Steve Smith Sr. unnecessary roughness/unsportsmanlike conduct penalty late in the 4th quarter. Because if anyone is going to sacrifice a win to show his former team that he’s still a badass, it’s Smith Sr. This is purely a home underdog pick for me. I don’t feel strongly enough to do anything other than grab the points and assume the underdogs are going to continue covering at a good rate. Besides, the NFC North might be that division that sends a 9-7 team to the playoffs (which unbelievably would be a ½ game better than last year’s division winner). The number of injuries that the Steelers are dealing with makes me think they’ll win, but not by enough. Either their starters won’t play well so Tampa keeps it close the whole game, or they’ll take starters out as soon as they can to preserve what little health they have left and the backups will give up some garbage time points. Either way this line is too high for an untrustworthy Pittsburgh team. If this game was in Oakland, I’d be jumping all over the Raiders moneyline. Enjoy that NFL game, London! Miami might be bad. Oakland might put up a garbage touchdown to get the backdoor cover. Both things might be true. I don’t like Miami as a four-point favorite in just about any scenario. The Chargers are legitimately the only team I feel safe backing this week in my Suicide Pool. The Colts would be next, but they’re still not completely reliable. I have trouble thinking about any scenario where all Suicide Pick entrants aren’t taking the Chargers for their team this week. However, I’m not ready to start backing teams that are two-touchdown favorites. Blake Bortles might just make this Jaguars team good enough to only lose by 10-13 points each week. Progress! I was a little surprised by this line. I figured with the 49ers looking bad in Arizona last week and the Eagles now sporting a 3-0 record, people would be dying to jump on Philly. What am I missing about this game that it should be more than a field goal in favor of San Francisco? Oh, the Eagles might be playing with five backups on their offensive line? Does that trump the ugliness with which San Francisco is currently playing football? I don’t know. But I’m in on the Eagles. I’m not convinced of two things regarding this Falcons team: 1) That they’re good on the road, and 2) That they’re good. And it’s not stressful to pick a rookie quarterback in Bridgewater to do well in his first start because guys like Derek Anderson and Austin Davis are winning games with regularity these days. Bill Belichick kind of owns Andy Reid. This Patriots team definitely gets to start playing the disrespect card as it seems anyone with a microphone is willing to talk about how bad they’ve been. It seems like a nationally televised game is a good opportunity to unleash Gronk, intercept Alex Smith a few times and walk off with people taking them seriously once again. Regardless of how my picks do this week, I’m just really happy that I was able to work Charlie Whitehurst so prominently into this blog. Enjoy week 4!